I have news for you. Star Wars is everywhere! Oh. You already knew that? OK, then! Obviously with The Force Awakens release, Star Wars fans young and old are all about the Jedi and their fight. 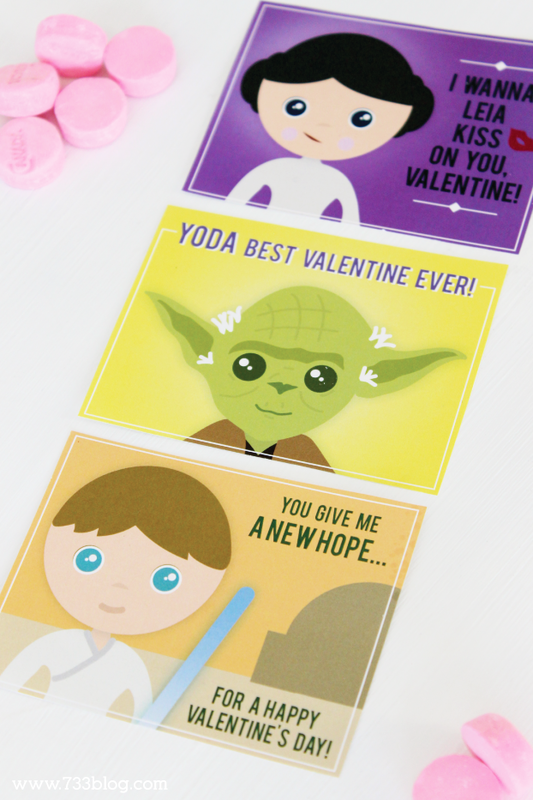 You can’t scroll too far down Facebook before hitting a Star Wars post, so I’m just going to go ahead and add to the barrage with my printable Star Wars Inspired Valentines! 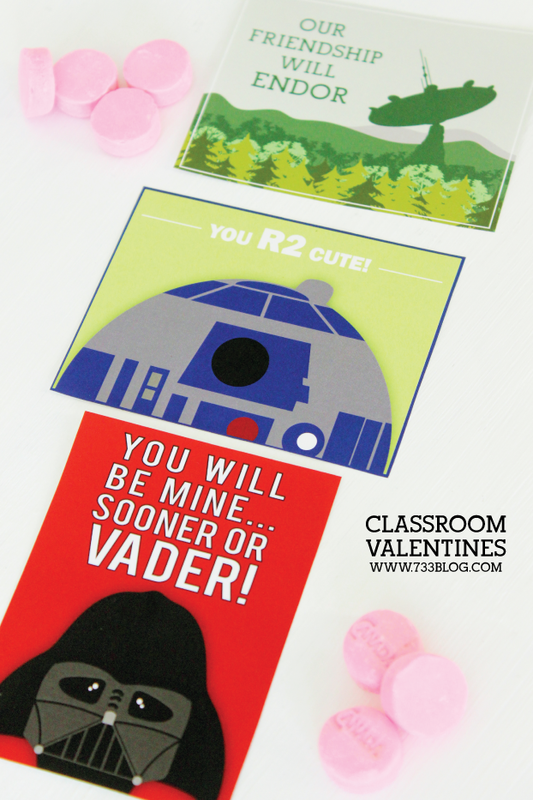 My family is 100% on the Star Wars wagon and my kids requested Star Wars Valentines this year, and I aim to please! I’ve made these available as a printable for those of you that also have Star Wars obsessed kids! These can be standalone or in addition to a small treat. I left the backs blank so that your child has plenty of room to write to and from info because I hate watching Kindergartners try to squeeze their names and their friends names on a tiny little line! My 6 year old daughter can not wait to hand out the Vader cards. She is hilarious. She has LOVED Vader for a couple of years now – she even dressed up as him for Halloween. While watching the movies she is constantly cheering Vader on… but I know she isn’t of the Dark Side because sometimes she forgets and tells Luke and Leia to “Hurry up! Come on, get out of there!” Then she remembers herself and goes back to cheering for Vader. It is definitely entertaining to listen to her. And I mean, come on! It is pretty cool that he has this amazing music start blaring when he walks into a room. I think I need to learn how to make an entrance like Darth! These are ADORABLE! I am sure they will be a big hit in my son’s 1st grade class. I love how unique they are so he won’t end up having matching Valentine’s. These are GREAT!! Thank you so much for sharing! Thank you so much for sharing your talent and great creations! These fun valentines will make my six-year-old’s day! Thank you for your kind words! I’m happy you’ll be able to put them to use.